Jumper and scarf store bought. All good things come to an end, right? This is what my last week of Me-Made-May looked like…or more accurately this is what I looked like. Day 25: Wearing my scrap bodysuit on Bank holiday Monday. I spent the whole day at home, so normally I would have stayed in PJs all day long, but we had my cousin’s family over for lunch, so I made an effort. A little one. Day 27: It’s hardly visible, but I’m wearing the bias cut camisole underneath that black top. We were allowed to wear jeans to work as the kids were off school, so even though I don’t usually wear them, I decided to go for it after much struggle in front of the wardrobe. I think my face says it all…it’s just not me at all. 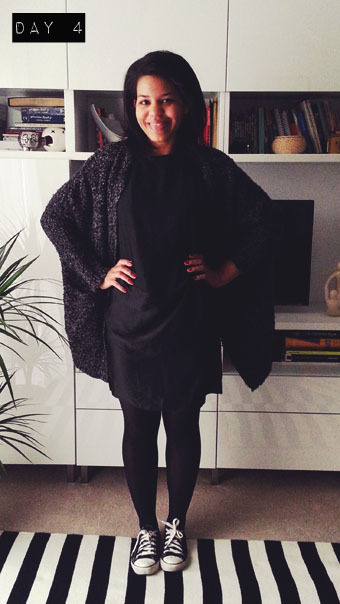 Day 28: Wearing that Burda(style) dress again with a vintage kimono. I guess you can tell by now how much I love this dress. Day 29: The newest addition to my me-made family! A wrap dress made of a very thin jersey. The pattern is from Burdastyle and I still like it a lot after making it up the second time. You can’t really see it but it actually has violet dots on a white background. Day 31: Aaand for the final day I decided to go with my favorite dress at the moment (the draped backless number). The top is a RTW see-through knit top which is similar to the one I’m attempting to knit from the reddish mohair yarn I got last year. Day 19: Ah, this yellow skirt again. It is still not quite finished, as you can see there are only 3 snaps holding it all together. I’m not in a hurry to finish it off though, as it’s a little too bright for my usual mood. Day 20: I love colour matching different garments and even though it feels a little bulky around the waist worn like this, this dress works pretty well for layering. Day 21: So does this. Although I feel like I look a little too comfy with the baggy jumper and loose skirt, this is one of those outfits that are great for a regular boring day sitting at the computer at work for 6 hours. Day 22: I knew I’d be cycling all day after work, running to see a friend in the city, then to see another one at the other side of town, so comfort was a priority. Instead of going through my me-made clothes, I decided to pick the Berlin bag for the challenge. I must admit I was way more excited doing it for the first time – last year, but that might just be because now I have so many handmade clothes that it doesn’t feel like a big challenge anymore. 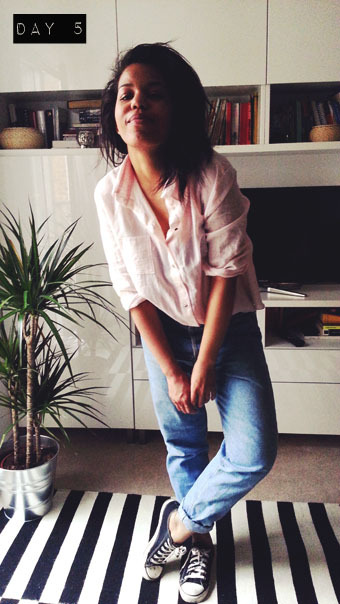 Also, while I really don’t mind repeating outfits, it’s not very exciting when I think about sharing photos of them. For next year I will hopefully be able to pledge to wear me-mades only, which should make things more exciting. Day 1: Wearing a refashioned thrift store skirt on the first day. I love the jumper (RTW) and pretty much every outfit including it. The skirt is a pencil skirt that can be unbuttoned all the way to the top, so that I can cycle comfortably in it. Day 5: Wearing a draped dress, with my favourite breton top. This is a pretty versatile dress which happened to be my second attempt at draping, but the invisible zipper needs to be replaced urgently! Day 7: This is the second version of the backless dress which is a modified version of this Burda number. It was not quite time to wear it in its full backless glory yet, hence the 90’s styling. Day 8: The latest addition to my velvet circle skirt family – a black one. Day 10: Wearing the velvet scrap top (made from the leftovers of the velvet skirt – Day 14) and the refashioned jeans. I’m not loving the top, but it makes me feel kind of good that I could save that much fabric from going into a landfill. Day 11: It was pretty chilly, and I felt uninspired, so opted for the good old military jacket. Day 12: Oh those red pants! I’ve just gotten some oil on the legs while cycling to Brighton :(. In other news, it fits really nicely straight out of the washing machine, but gets about a size and a half bigger by the end of the day. It’s either plain weird or I’ve cut the waistband on the bias and I shouldn’t have. You be the judge. Day 13: This marks my first attempt at cutting a pattern on the bias (on purpose)! It’s a copy of my sister’s beautiful little camisole and it turned out quite nicely. It’s made from some poly remnant and was supposed to be a muslin, but I realized that I can actually make it work with some bolder pieces like this skirt/trouser loveliness that I bought in Thailand recently. 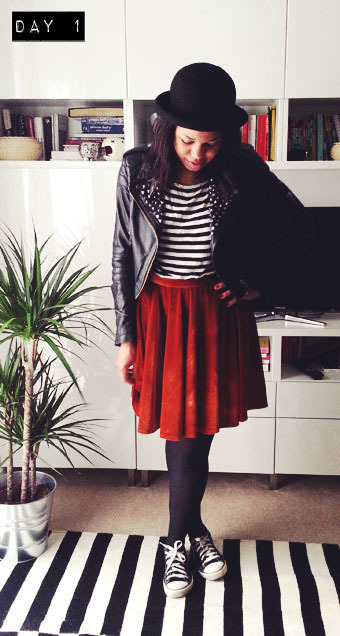 Day 14: Velvet skirt numero 3 – or the number one, in the prettiest rust colour out there. Still my favourite (I think I am overusing this word now, so forget the others this is the actual fave)! Day 15: Attempting to cycle to Brighton from London. I have worn this outfit during the first week already, but I thought it deserves another mention as it took me from work, to cycling through forests (thanks for the misguidance Google) and since I got oil on those red trousers, it took me straight into the many pubs of Brighton too.